Statewide fire danger ranged from Low to Very High this past week. 88 fires burned 156 acres in DNR Protection Areas; 12 buildings were destroyed and another 30 were threatened, but saved with firefighter assistance. 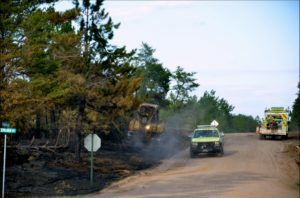 The main wildfire causes this week were debris burning and equipment. 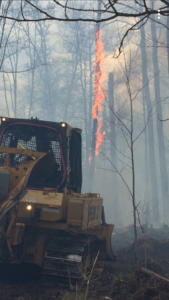 The largest fire of the week burned 27 acres in Langlade County, caused by a campfire. People are urged to continue to use caution with all types of outdoor burning, ash disposal and equipment use. Property owners are reminded to remain present when burning debris in a barrel or on the ground – should your fire escape, you can be held responsible for the cost of fire suppression and any damages resulting from the escaped fire. Clear an area around the pile or barrel and make sure a hose is attached to a working spigot. Wet down the burned area before leaving. Stay aware of the current fire danger for your area by checking our website: dnr.wi.gov, keyword “fire”. May 14 marks the 5th anniversary of the Germann Road Fire that burned 7,442 acres and 100 buildings (including 22 homes and cabins) in Douglas County. Firewise Tip: Are there any branches or dead trees close to power lines near your property? Ask the power company to clear them.